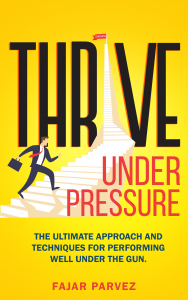 So let your journey of thriving begin with this though-provoking short read which will surely leave a lasting impact and completely change your view regarding pressure situations. This book is free from 04/06/2019 until 04/09/2019. This productivity book combines the most effective, innovative techniques related to all aspects of the industry. Investing in Power Up Your Productivity is an investment in your future. Have you powered up your productivity? Not sure what I’m talking about? That’s the first problem. If you’re a business leader or haven’t yet heard of this new movement, then you’d better keep reading! This time management book will introduce you to the invaluable business instinct that I call powering up your productivity. You don’t have to be born with the sales instinct or the cutthroat drive required of successful businessmen and women; you can learn it–right here. My unique approach to succeeding in the business world rests on the conviction that with persistence, practice and a little inspiration, anyone can turn distress into success. – Candid insight on job market etiquette – what hiring committees don’t want you to know. – Failsafe strategies to conquer procrastination, reign in distraction, and focus on your future. – Expert tips on making networking work for you… both online and off. – The conviction and self-confidence to land that business deal, ace that sales pitch, and rapidly climb the corporate ladder.